3-1/2 x 5" 5 x 7" 7 x 9"
7x9" Natural Cotton Favor Bags with Metallic SilverTiny Dots are made from 3 oz cotton with 100% cotton cord closure. 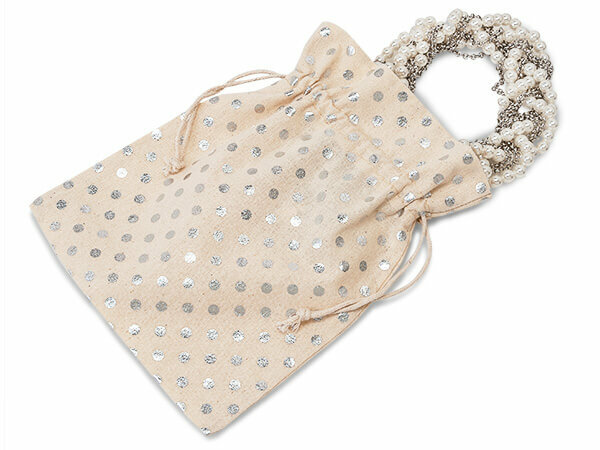 Natural hot stamped metallic and silver polka dot bags are made from 100% cotton. Bags have double closure drawstring cotton cords. A great natural upscale look. Great for soaps, oils, cosmetics, crafts, gift cards, and jewelry. Bags are imported and hand sewn, colors and size may vary slightly from shipment to shipment.